Thank you, Dogfish Head for being our current leading Oyster Gardening sponsor! The Center’s Oyster Gardening program is a restoration project that employs waterfront property owners to raise small amounts of oysters in the waters that surround their docks and bulkheads. The Center provides juvenile oysters and gear to raise them; the “gardeners” provide basic husbandry and grow them for about one year, when they will then be used in restoration projects. The program began in 2003 through a generous grant from the National Fish & Wildlife Foundation’s Five-star Restoration Challenge Grant Program. The program brings together scientists and volunteers in an effort to restore the American Oyster (Crassostrea virginica) to the waters of Delaware’s Inland Bays. The program is now a cooperative effort between the CIB, the Sea Grant Marine Advisory Program, the Town of South Bethany and volunteers! The Oyster Gardening program employs volunteer gardeners to care for small “spat”, growing them to adult size by practicing basic husbandry techniques. Each gardener is responsible for one site, and each site grows approximately one-hundred oysters, using spat stocks and gear provided by the CIB. Oyster larvae used in the program are hatchery produced at the Rutgers University Haskin Shellfish Research Laboratory, using broodstock lines bred for resistance to MSX and Dermo disease. In the hatchery, a million or more microscopic oyster larvae are exposed to spent oyster shell to imitate the natural “setting” process. During early summer, trays of oyster shell with fingernail sized spat are then distributed throughout the Inland Bays to the gardeners for grow-out in their Taylor Floats. Gardeners will be in possession of the oysters for one year, when CIB will remove them and place them in various restoration or research projects throughout the bays. Oyster Gardening oysters are not grown for food and are not suitable for human consumption. Educate volunteers and the general public about the ecology and value of a healthy population of Inland Bays oysters. Q – Don’t we already have oysters in the Inland Bays? A – Delaware’s Inland Bays have a very small natural population of oysters. The Center believes that oysters were at one time, and hopefully will again be, a thriving and important component of Inland Bays’ ecology. The goal of our Shellfish Restoration Program (which includes the Oyster Gardening efforts) is to restore a viable population of oysters to our local waterways, thereby creating critical benthic (bottom) habitat and increasing the filtering capacity of the bays’ shellfish population. Q – Tell me about oysters, why are they so special? A – Oysters are like the building blocks of the benthic community and create very important reef habitats for other organisms. Some of the many important species you will find around an oyster reef include: barnacles, mussels, bryozoans, worms, algae, plankton, as well as several kinds of fishes and crabs. Our oysters are not meant for harvest but for creating more reef habitat. Oysters are also filter feeders; they can remove tiny one-celled plants called phytoplankton and other small particles from the water and improve water quality. Q – You cage oysters? A – Yes. Special cages and floats were built to hold the oysters. We don’t have to worry about oysters swimming away, but the cages helped contain the growing spat for a scientific study and survival. The cages allowed a good supply of food and oxygen to reach the oysters near the surface. They also reduced the threat from predators and sedimentation. The cages and floats make it easy for the volunteers to maintain the oyster garden populations. The goal is to provide the juvenile oysters a protected environment which will result in more successful survival rates. Q – How big are the cages or floats? A – Taylor floats with wire inserts are ideal for volunteers with access to waterfront property. Each “gardener” is supplied with one float and two wire inserts.. The dimensions of a Taylor float are 2′ x 3′. Oyster “spat” are placed inside the insert, which rests inside the Taylor float. Each insert has a carrying capacity of approximately 75-100 shells with spat. The floats are suspended from gardeners’ piers, docks or bulkheads. When necessary, they can be lifted from the water in a similar manner as crab traps. However, the Taylor floats must be suspended at least a foot off bottom to avoid oyster drill predation. A – Yes, 15 volunteers signed on as participants in our pilot oyster gardening project. Now we have approximately 70 sites. They maintain the oysters and keep the cages clear of bio-fouling. Volunteers have also assisted with measuring and recording oyster growth and mortality as well as water quality parameters, such as temperature and salinity. The volunteers are involved for several reasons: to play a hands-on role in oyster restoration, to educate their neighbors and friends about the benefits of a healthy oyster population, and to provide a diverse array of study sites throughout the Inland Bays system. Q – Where do the volunteers get the baby oysters to start their project? 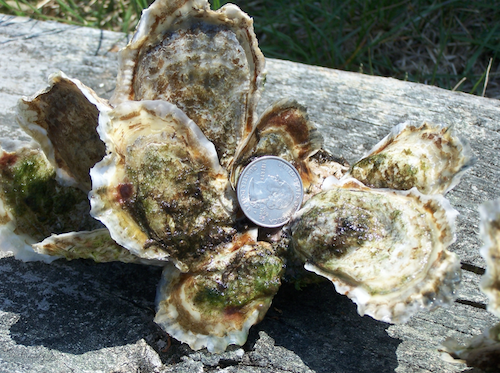 A – The juvenile oysters, known as “spat-on-shell”, come from a disease resistant line of larvae produced at the Rutgers University Haskin Shellfish Laboratory. “Spat” are tiny free-swimming larval oysters that attach themselves (in the tens to hundreds!) on spent oyster shells, also called “cultch”, collected by the CIB’s “Don’t Chuck Your Shucks” shell recycling program, at the University of Delaware’s College Earth, Ocean and Environment’s campus in Lewes. The “spat” are then transferred to the wire inserts, which are placed inside the Taylor floats. Q – Can humans eat the oysters? A – Oyster Gardening oysters are not suitable for human consumption and we prohibit our gardeners from consuming the oysters. If we are successful in our efforts to restore oysters to the Inland Bays, there may be future opportunities for recreational harvesting of oysters for personal consumption. Q – Where are you putting the oysters? A – Oyster Gardening oysters have been planted in rip rap located throughout the Inland Bays. Some have been used in various research projects. In the future, the Center envisions using many of the oysters in Living Shorelines. Also known as “soft-armoring”, this technique mimics natural shoreline features to reduce shoreline erosion. Research indicates that Living Shorelines improve desirable aquatic habitat (fish and crabs! ), reduce nutrient inputs into the Inland Bays and are often more resilient than traditional hardened shoreline techniques. Q – What does it take to be an Oyster Gardener? A – Waterfront property owners with the ability to lift approximately 25 pounds out of the water are eligible to participate. The Center also requires Oyster Gardeners to have email, and to grant Center staff access to the gear during normal business hours. At present, there is no cost to participate. Since it is estimated that a single mature oyster can filter up to 50 gallons of water each day, think of the positive impact we could produce by placing 100,000 oysters in our bays year after year! Give us a call if you’d like to be considered for our Oyster Gardening program. The Center’s office number is 302-226-8105 or contact the Program Manager at jamesfarm@inlandbays.org.